Erin got out of the cab and walked into the yard of a place that sold cars. It wasn't far from where she lived and Erin was actually looking forward to finally being able to buy her first car. She had made her licence about 2 years ago and had recently borrowed her dad to get some practice. Now with Johanna being born she could use a small car to get around and Erin had saved some money way before she was raped, so she could buy a car for herself. Her parents would help her with insurance and necessarities for now. Erin walked up on the yard and looked around for a used car she buy. One that looked okay and was okay. Steve was already at the dealer at this time. When he saw Erin arrive, he walked over to her. He wanted to help her out in getting the right car for her and Johanna. "Hello Erin.....ready to find the right car?" he asked, smiling a bit as he said that to her. That aside, he knew how important it was for Erin to be doing this. He knew that she wanted to have car of her own so she didn't have to use anyone else's car to get around. Erin turned around and looked at Steve upon hearing his voice. She gave him a happy smile and nodded a little in reply. "Yep. Finally get the chance to find my own four wheels." Erin said to him. It was an important day for Erin and she was glad that this day had finally arrived. Although she missed her daughter terribly, being apart from Johanna for the very first time, she knew that both of them would learn an important lesson today. And for both of them it would be an important day of their lives. Erin had already thought about what kind of car she would buy. It had to be a used car - she couldn't possibly afford a new one. And not too big, since she didn't have a parking garage and she didn't need such a big car anyway. Maybe a VW or small Ford or whatever else they had. Steve nodded in reply as he listened to Erin say that to him. He knew that she wanted a used car. At the same time, he could tell that Erin was missing her daughter, but knew that they would lean a lesson today. "Used cars are a good place to start." he said to her. "My advice: go with a Ford.....they have a good track record of making reliable cars." Sean added, winking a bit as he said that. In his family, all they drove were Fords. True they liked other cars as well, but at the end of the day, they went with Ford, which reflected the Andersen family's "sleeves up, nine to five" work ethic. Erin gave Steve a slight frown at his recommandation. She had opted more for the German VW car, than a Ford, but her choice would depend on the quality of the car and her budget. "Well, I personally would rather want a Volkswagen, than Ford... but it depends on the car and my budget." Erin replied seriously. Steve nodded a bit in reply when Erin said that. "I understand" he said to her gently. "I was just offering a suggestion, you have the final say." he added, smiling a bit at the same time. He didn't want to force Erin into getting something she didn't want or could not afford. Erin nodded a little in reply. She knew that it was just a suggestion, but she just wanted to speak her mind, so Steve knew what she was primarily looking for. It didn't need to be a big car, just a small one, but one with doors to the backseats, if it had any, so they could go with three people and Johanna was easily being put in the back. 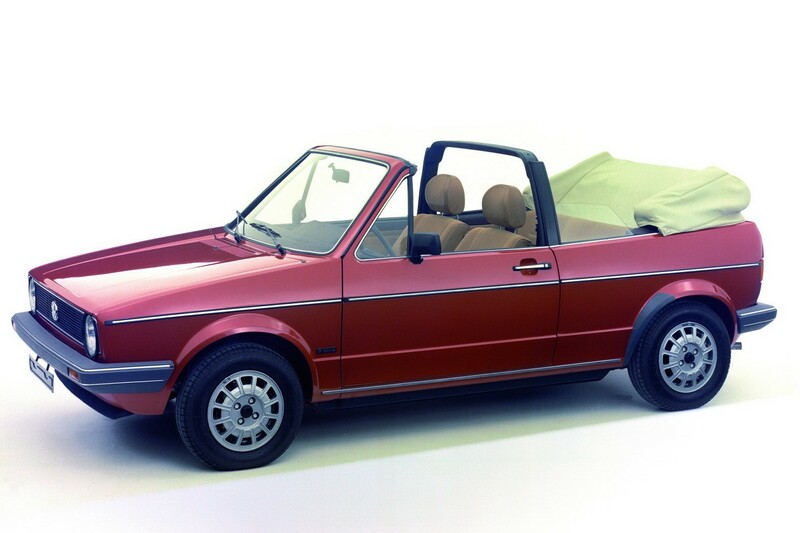 However, if they had a Golf 1 Cabrio then Erin would buy it. Preferably in red, but if they didn't have it in red, she'd safe some more money and paint it one day. But it would be her dream car for a first car. As Erin wandered through the rows of used car, she got lucky. A red Golf Cabrio. If her dream could come true now? "Look over there, Steve." she said, pointing into the direction of the car. "See the red Convertable?" Steve looked over when Erin said that, seeing the car in question. "I see it Erin." he replied before walking over to the car. Once there he looked it over and smiled a bit. "You have a good eye Erin." he said to her with a slight nod at the same time. As he stood there, he pictured Erin, Johanna and himself in the car, a smile coming to his face at the same time. "You like it?" he asked while looking up to her. Erin smiled happily at the 'treasure' she had found. And she looked at the prize that was written on a paper inside the car. It was a little bit more than she had intended to spend, but if the car was in good condition, Erin was willing to pay the few extra bucks. It was her dream car after all. "Are you kiddin'? It's the car I've had in mind since I wanted to buy one." she said happily. Knowing a little bit about cars herself, she started to walk around the red VW Golf 1 Cabriolet and checked a few things she had learned to check. The tires for example. She also checked the quality of the hood, but it appeared to be a new one. The hood as well as the interior of the car was of a light brown color, very stylish to the dark red of the car. Erin definitely loved that vehicle. By the time Erin finished inspecting the car, the shop's owner walked up to them. He had seen that the young woman obviously was interested in the red car and he smiled a little bit, as he greeted Erin and Steve. Steve smiled a bit when Erin said that to him, then nodded. "Point taken" he replied as the man walked up to them. Steve looked over and saw him. It was clear that he was a gear head. "You picked a nice car." the guy said to Erin. Steve nodded a bit when she said that. "That she did" Steve said to him in reply. The man smiled a bit, then looked at the car. Steve watched the man walked around, checking it out closely at the same time. "I take it your a gear head?" Steve asked off the cuff. The man looked up when Steve said that. "That I am" the man replied, nodding a bit as he said that to Steve. Erin looked at the owner, watching him. She considered buying this beauty, but she wanted to get a test drive before she did. After all, a car could look nice on the outside, it didn't mean it was all okay on the inside. "I was wondering... could I go on a test drive?" Erin asked the still quite young-looking man. "Sure" the man said to her in reply. He then got the keys to the car and handed them over to Erin. As he did, he told her a bit about the car. Steve listened at the same time while standing next to Erin. "Impressive" Steve said to the guy after he finished. Erin smiled a little bit to herself, listening to the man telling her about the car. Of course, having done her research and having an interest in that kind of thing, Erin knew all about this car. She was about to buy it, she had always wanted a car like this, of course she knew all about it. "The thing I like about this car, and the reason why I rather buy one of these and not just any cabrio is the roll bar." Erin said. "Well... besides that I simply like this German Car brand. In Germany some called the red version "Erdbeerkoerbchen"... meaning strawberry basket, because of the roll bar. But it's safer than a cabrio without that it." One glance at the owner of this shop was enough for Erin to see that he didn't expect Erin would know so much about this car. He didn't know about the nickname of the car and he was slightly impressed that this young woman knew about the safety of a roll bar, let alone that she knew what a roll bar was. Of course, being a guy, he probably wouldn't say so though. But it let Erin smile in her mind. Steve looked at Erin when she said that, it was clear he was impressed with her knowledge of the car in question. The lot owner recomposed himself after Erin said that, then walked up to her. "Wold you like to take it for a test drive?" he asked Erin while he stood there, watching her and Steve at the same time. Steve took Erin's hand as the older man said that to her. "That's what I asked for just a minute ago..." Erin countered, raising her brow at his unnecessary question. "I'd love to. I don't buy without testing." Usually Erin would have been a little more polite, or maybe a little more shy, but this was her first car they were talking about and she noticed how impressed this owner was with her knowledge, that definitely increased her confidence. "He probably thought I'm one of the dumb girls who don't have a clue about what they're buying." she thought in amusement. Steve noticed it as he watched them, holding back a grin at what the guy had done. The salesmen nodded, then handed the keys over to Erin. "You won't be disappointed" the man said to her. Steve watched him as he said that to Erin. "I'm sure she won't be" he added while watching them. "We will see about that." Erin replied as self-confident as she was when she first came here. Right now she was all business. Whether or not she would be disappointed wasn't to be decided yet. She would make her decision after the test drive. Erin unlocked the red Golf Cabrio and got into the driver's seat. She smiled a little bit, sitting behind the wheel after quite some time again. And this could be her own four wheels. Her first car ever. Truth be told - Erin was excited about this, but she knew better than to show that too obvious. After all, she wasn't some teenage girl, she was a young, responsible woman, mother of a little girl. Steve noticed it as he watched her get into the car. "What do you think?" he called out to her as he stood there. There was a slight smile on his face at the same time. He was happy for Erin that she was getting this car so she could better support herself and Johanna. The dealer noticed it as well as he stood across from Steve. Steve glanced over to the guy, then looked back at Erin. "Ask me again, when I'm back from my test drive." Erin said to Steve, but she was smiling. She liked the feel of the car, just sitting in it. Right now she was willing to take it, but the test drive was necessary to ensure that she wouldn't buy a trojan horse. The owner of the car shop got into the car on the passenger seat. He had to come along, that was a rule and Erin knew that. Steve got into the back of the car at the same time and buckled up. He then looked around the car at the same time and smiled a bit. Nice pick Erin he said to himself as he sat there, clearly impressed with the kind of car that Erin picked out. It was clear to him that Erin had a good eye for picking out the right car for her and Johanna. After everyone was inside the car and ready to go, Erin started the engine. The car started without any quirks, conjuring a satisfied smile onto Erin's face. She let the car stand in idle running, just to see how it was running and to have a loog at the number or revolutions. As she looked at the rev meter and listened to sound of engine, Erin nodded a little, a very satisfied look on her face. She was happy with what she was seeing and hearing. The car seemed to be in a very good shape for it's age, seeing that it wasn't a new car. Now followed the actual fun part of the test drive: the drive itself. Erin was curious to see how the car would do in the city's traffic and if it was really in such a good shape as she thought it was. But truth be told: Erin would have been sad if the car wasn't what it promised to be. "Here we go." she said and drove the Golf Cabrio off the yard. Steve held on as Erin pulled out of the lot. "Smooth ride so far" he said as Erin pulled out of dealership and onto the main road. Steve glanced back to the salesman, then back to Erin. "What do you think so far?" he asked while watching her drive the car off the lot. "A little too soon to judge." Erin replied seriously, concentrating on her driving and yet observing the car as she slowly pulled onto the road and then went to drive around the block and maybe for a small ride on the High Way, or Free Way. There was a lot to consider, before she would make her final decision and Erin wouldn't comment on her thoughts until they were back at the shop. Steve nodded in reply when Erin said that to him. "Point taken" he said to her before looking out the window of the car. He had a feeling that Erin might take this one, but, like she said, it was to early to tell. Erin drove around town for a little bit and then decided to take her car for a spin on the road where she could go a little faster. From what she saw, heard and felt so far, she really loved this car and the more time she spent on this test drive, the more certain she got she was going to buy it. A small smile was playing on her lips as she drove onto the High Way.